by Dave from The Longest Way Home ~ January 20th, 2016. Updated on January 22nd, 2016. Published in: Travel blog » Nepal. I never really understood why so many people liked tea. The whole world seemed to like it and I was always the odd the one out. To me tea always came in a little soggy bag and never quite had the punch of an espresso. Why everyone liked it so much was a complete mystery to me. I did wonder if it was the whole “Nescafe” syndrome and people had simply opted to like a generic brand rather than a more natural brew. However, out of curiosity, in many countries I’d often try a cup of tea . Or, in some places, out of obligation as tea has become a stalwart of introductions and hospitality. To be frank, across Europe I was never impressed with tea. In China I liked the little shops but found the flavors very watered down. In Iran it was served with great pomp which was far more impressive than the taste. Likewise in Turkey. In India the chai tasted nothing like tea. It was more like a milky malted chocolate drink. So naturally I liked it due to it tasting nothing like tea! I was also never impressed with tea in Nepal. In fact this is where I was first introduced to the mouth wrenching “yak butter tea” Buddhist monks like so much. Likewise in Tibet I was left with a near gag reflex over the clarified butter globules I found floating in the tea. Vile. In Malaysia I visited the tea plantations in the Cameron Highlands and drank fresh tea. Again, for me, it was nothing to get excited about. In Nepal nearly everyone invites you in for tea. I always opt for a plain glass of water. But on one fourtuate day my friend Jagganath, who owns a tea shop, questioned my ire for tea. “What about golden tips or Ilam? Have you tried these?” His knowledgeable smile told me he already knew more than most. Sure enough there was quite a difference between golden tips and Ilam tea. Jagannath then opened up an old tin tea box of silver tips. I’d never seen the like before. Silver tea? It was indeed. It seemed I had stumbled onto the sommelier of tea in Nepal. Jagannath treated his tea like fine wines. Each one had a unique blend and vintage depending on the area it was produced, the season it was plucked, the drying process and so much more. Jagannath offered to teach me about each blend. Each day I returned I would sit with him with a new blend of hot tea in my hand as we savoured the different tastes until I would find one I liked. Ask anyone in Nepal what tea is the best and the majority will say Ilam. 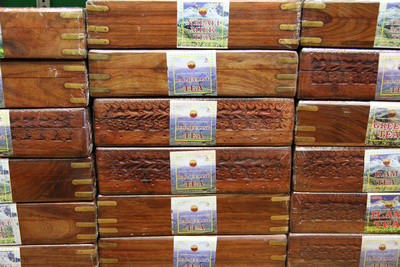 It’s the most common mid-priced tea in Nepal that was first brewed in 1863 in eastern Nepal. 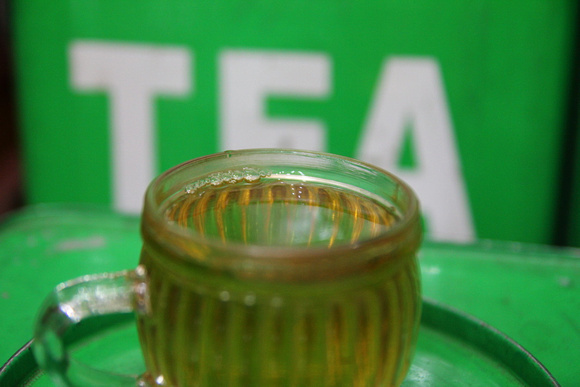 It shares a lot with its famous counterpart Darjeeling tea from India as the two regions are very similar. The important thing to realise with Ilam tea is that not only is it the most popular in Nepal but it is also a source of national pride. Tea connoisseurs all over the world also consider ilam tea to be superior to Darjeeling tea due to it’s aroma, clarity and taste. There are also different variations of Ilam tea from crush, tear, curl (the most common from is frown in the low lands) to the prime first flush orthodox versions. To me though, it was similar to many other types of tea. I was not sold on it. So we moved on. Can tea really be the color of silver? 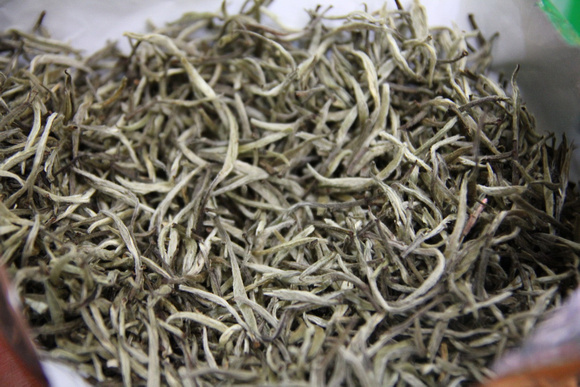 Silver Tips tea is also known as White Tea. It is said to be one of the the purest, least processed types of tea available. Made from tender spring buds and lightly dried it’s very low in caffeine while extremely high in antioxidants. The taste is nothing really like tea. It’s slightly bitter but light and fresh. Jagganath showed me how the second wash of the tea changed the flavor and it was slightly more pungent. The most interesting fact of all is that silver tips tea left ones mouth with a slight buzz or tingling sensation. It’s very popular with Russians and east Europeans but for me it was more a curiosity than a true liking. Here’s a little tip when buying tea in Nepal that Jagganath taught me. 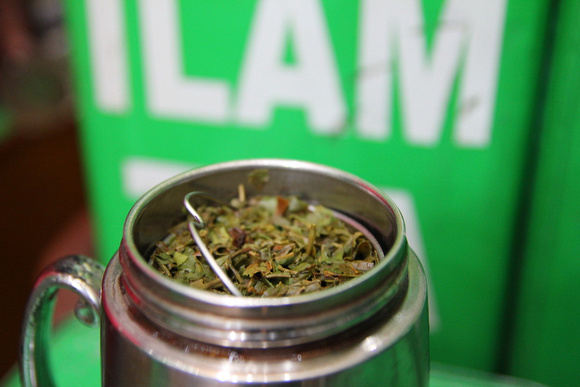 Tea with flavors like lemon, orange, banana and even jasmine are artificially flavored. The fruit is actually just artificial flavoring from China. It’s not pure and best avoided. Best to find real jasmine tea in China or Japan. 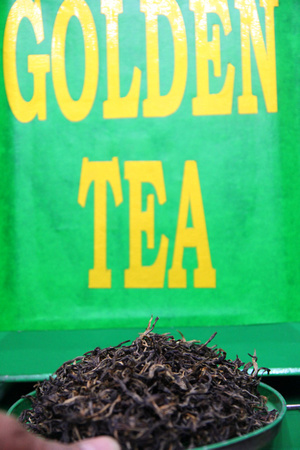 The idea of drinking golden tips tea a few days after silver tips tea appealed. Then Jagannath added something new to the tea equations. First flush golden tips. Tea has several “flushes”. This is essentially spring tea or the first young tea leaves of the year which are picked. This first flush is often considered the very best. As is golden tips which are the very top tips of the tea. It’s also an orthodox tea meaning it is grown over 3,000 meters largely in the eastern region of Nepal. The taste is very refreshing. It’s so light the flavour is positively delicate. Much to Jagannath’s amusement I prefered my first flush golden tips tea mildly warm instead of the near boiling hot tea he can swallow with ease. First flush golden tips is so go good I’d even consider it as a day time cold drink or a refreshing trekking drink stored in a bottle. It’s that good. 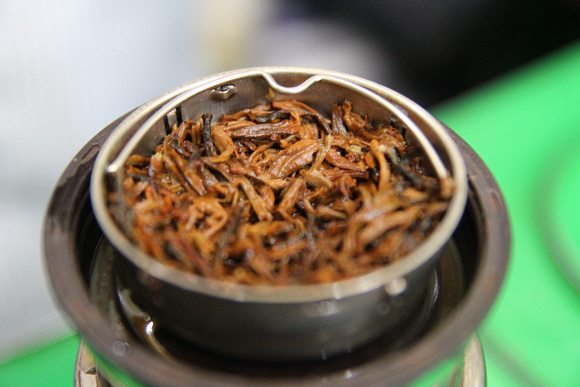 Naturally enough being a double prime tea first flush golden tips is the most expensive you can buy in Nepal. With prices upwards of 12,000 rupees per kilo. Normal Ilam tea prices by comparison range from 1,500 to 2,500 rupees per kilo. Masala tea in Nepal is very different to India. The masala spices added are pungent and aromatic. I would say it would be good for those like a lot of depth to their tea. Milk is often added but it’s added cold which is very different to the hot chai of India. It’s a savory tea that many people from China come to buy as do tea lovers from India. Much like its name this tea is best served with milk. It’s not a favorite of mine but the Japanese love it as do Romanians and Nepalese. I’m not that much of connoisseur of tea to detect the difference between milk tea or ilam tea with a drop of milk added to it. I’ve never been a fan of green tea. I just don’t get it. With so many healing qualities it’s very popular around the world. By all means give it a try but it’s really for green tea lovers I think! During all this tea tasting I quickly learned of the great tea blenders of Nepal. I include Jagannath as a great tea blender after learning how he blends his own tea in his house. 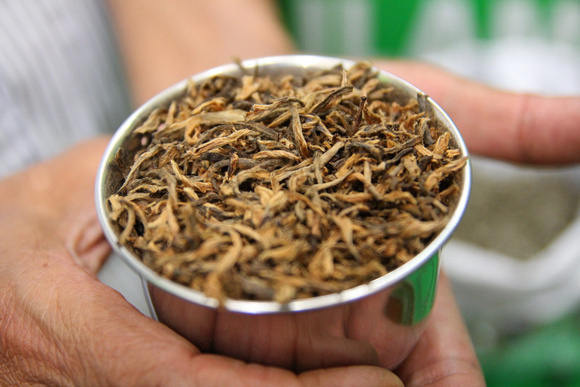 From golden tips to silver tips, darjeeling to green tea everything in his shop has been chosen and blended personally. He even goes so far to pack a lot of his tea in ornate wooden boxes which make for beautiful gifts which can later be used as jewelry boxes or the like. Alternatively you can choose traditional tea chests or handcrafted bags of tea. His repeat customers simply settle for a couple of kilos wrapped air tight to maintain their freshness. Jagannath’s store is called Himalayan Garden Tea. It’s located just down from Thamel Chowk (Narsing Chowk) opposite the Sandwich point on Thamel Marg (+977-1-4268924). One word to the wise though. 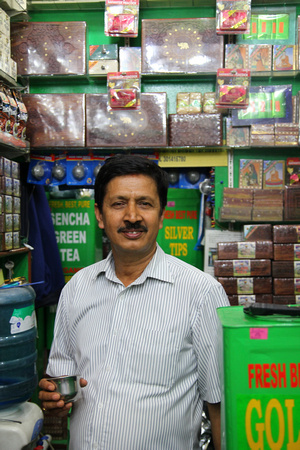 Don’t go too early to visit his store as Jagannath is usually at home in the morning blending tea. A better bet is to visit between 11.30am and 8.00pm. One more tip. Although he doesn’t do this for every customer. If you mention my name he’ll give you a taste test of your choice of tea! Get my Kathmandu Valley Guidebook to learn more about Nepal!